I made a quick visit to H&M, and found these adorable accessories. They had so many beautiful things... I wanna try on some pieces from their Conscious collection, but I'm worried everyone will have that palm tree/toucan print! 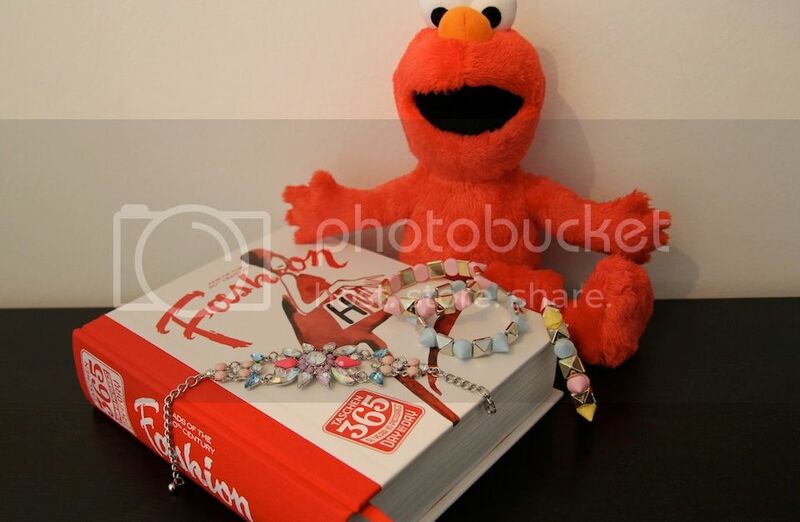 While paying I found the Fashion book... and the Elmo for Lemon ^^. I bet Lemon will like this Elmop, it's very cute! Wow, I like that fashion book! And gorgeous bracelets! Need to go to H&M! That bracelets are amazing! You made a great pick with those bracelets. Awwww, son un sueño ambos modelos! El día que abran un H&M en Argentina me fundo, I swear. Those candy-colored bracelets are entirely too cute. I love them with the studs. Such a playful take on something that's usually considered so tough. Lovely necklace Ileanna. Love to see you wearing it. Ooh I love the jewelry! Love these new accessories! And how sweet Elmo for Lemon! Oh my gosh, those are beautiful! I love that bracelet! I want to get this fashion book too! !Love the necklace!! Gorgeous items! I need to go to H&M soon. oh man, those are gorgeous, I think I'll have to make a trip to H&M as well. Cute blog, following you now! The floral bracelet is beautiful !